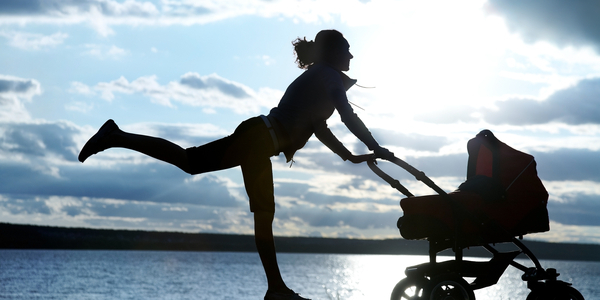 The topic of returning to exercise after giving birth is always confusing for the new mom. Doctors recommend to rest during the six first weeks after the baby is born, but what to do after that is sometimes a big dilemma for a woman often desperate to get the post-baby body back. Each person is different, and while some can be ready to start some form of exercise at week 6, others may need more time or any specific treatment depending on birth complications and fitness level. Visiting a women’s health specialist is a good start to assess the possibility to get back into exercise and what type of exercise would be suitable in your case. Incontinence, diastasis and prolapse are the number one enemies of the post-natal women, and sometimes we are not even aware that these problems can occur!. I heard so many times the comment from clients, “why didn’t anyone tell me this could happen to me?!”. When no one gives you the right information about the changes going on in your body and how to exercise safely, you don’t know what to do. The two extremes usually happen, you either try to get back into your pre-pregnancy exercise routine, or you just stop any form of exercise. Both are bad choices, and a point in between should be the way to go. On one side, rushing into the gym and exercise in the same way you used to before becoming pregnant will only bring pain and dysfunctions in the short and long term. The body has gone through 42 weeks of significant physical changes, the muscles and ligaments have been stretched, and your internal organs have moved to make space for the baby to grow. Also, the hormonal changes produced during pregnancy modify the composition of the connective tissue, making your ligaments and muscles of the pelvic area more lax to prepare for birth. Some people think that once the baby is out of their bodies, everything goes back to normal.The reality is that after nine months of changes, we can’t expect the body to be back to normal in 6 weeks! After birth, the body is still going through physiological and physical changes and is important to respect that process. Resuming your weight lifting program, your running or even the advanced yoga or Pilates classes you used to do, will likely cause you back and pelvic pain or dysfunctions such severe incontinence or pelvic organ prolapse because YOUR BODY IS NOT READY FOR THAT YET. The process of recovering from childbirth requires patience, and a gradual return to exercise will have more efficient and long-lasting results. On the other side of the coin, we have the opposite reaction. Not exercising at all and expect the body to get back to its pre-pregnancy state by itself. Although letting your body heal is probably better than punishing it at the gym, as I mentioned before, pregnancy and birth bring a lot of physical changes, and you need to guide your body through that healing process. Once you had your baby, your body needs to be prepared for the demands that having a child involves: lift and hold the baby for extended periods of time, carry the pram and put it in the car, bending over to change nappies, and the list goes on. Getting your core, your back and your pelvic floor working efficiently to provide enough support should be your primary fitness goal in this stage. Not doing anything will lead to the same problems that you would have as if you were training too much, pain and dysfunction. The first step you need to take is to get clearance from your doctor. Also, visiting a pelvic floor specialists that can assess the status of your muscles and internal organs and consider specific exercises is a good idea. Be patient and listen to your body. Return to exercise progressively, with the primary focus on restoring the function of your abdominal and pelvic muscles, which are the center and most important part of your body. Is not all about keeping them strong, is about keeping them working appropriately according to the demands of your physical activity. Gravity will play against your pelvic floor restoration and pelvic organ repositioning. Avoiding high impact activities, heavy lifting or standing for extended periods of time is highly recommended for at least the first 12 weeks. After that period you can progressively include this type of exercise into your routine, without leaving aside maintaining your core and pelvic floor function. Parenting can be sometimes exhausting and have one hour for yourself is also hard most of the times. Breaking the exercise into small bouts throughout the day can be more manageable than a one-hour full session. The exercises included in the Low Pressure Fitness routine are an excellent option for mums looking into a safe return to exercise. This method takes a holistic approach to core training, it is designed to restore the pelvic floor and core function as well as the breathing patterns and correct the posture. Its practice also helps to reduce abdominal separation, prolapse and the incidence of urinary incontinence. The exercises included are very easy to perform, and once you have learned them correctly, you can practice at home by yourself with no risks. There is no equipment required, and as little as 20 minutes, practised regularly, you can have amazing results. For more information, check out other blog posts and the about section of our website.